There’s no avoiding it. Dogs can be extremely vigilant in their quest for something to nibble on — a bone here, a shoe there, and even a plant or two. The problem is that there are many toxic plants to dogs; therefore, knowing what plants are poisonous to dogs can go a long way in preventing something tragic from happening and keeping your pet safe around the house. There are numerous plants that are poisonous to dogs. Because of this, it would be nearly impossible to go through and name each one (along with symptoms) in one brief article. Therefore, I’ve decided to split some of the mast common toxic plants to dogs into three categories: those that are mildly poisonous, moderately poisonous, and severely toxic. Ivy, poinsettia, tansy, nettle, wisteria (seeds/pods), and iris can all result in mild to severe digestive upset. Buttercups (Ranunculus) contain juices that can severely irritate, or even damage, a dog’s digestive system. Jack-in-the-pulpit can lead to intense burning and irritation of the mouth and tongue. Numerous types of bulbs can moderately affect dogs. Those like hyacinth and daffodil bulbs can cause vomiting, diarrhea, and even death in large amounts. Crocus, lily-of-the-valley, and star of Bethlehem can result in vomiting, nervous excitement, irregular heartbeat, digestive upset, and confusion. Plants in the Aroid family (such as dumbcane) can cause intense mouth and throat irritation. Azalea and rhododendrons cause nausea, vomiting, depression, breathing difficulty, coma, and even death in severe cases. Larkspur (Delphinium) young plants and seeds lead to digestive upset, nervous excitement, and depression. Foxglove (Digitalis) in large amounts can cause irregular heartbeat, digestive upset and mental confusion. Members of the Nightshade family, especially berries, can lead to intense digestive upset and nervous problems which can be fatal. Both leaves and acorns from oak trees can affect the kidneys while the bark and foliage of black locust trees cause nausea, weakness, and depression. 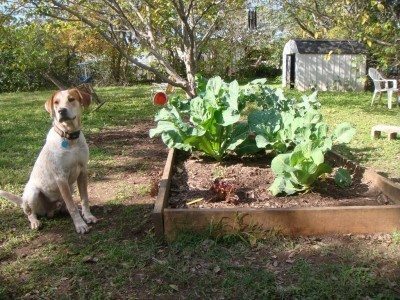 Seeds and berries can be a major concern for dog owners. Rosary pea and castor bean seeds can quickly spell disaster for your pet, often leading to death. Both mistletoe and jasmine berries can cause digestive and nervous system failure, resulting in death. Yew berries (as well as foliage) can cause sudden death. Plants like poison and water hemlock can lead to violent, painful convulsions and death. Large amounts of raw or cooked rhubarb can also cause convulsions followed by coma and death. Jimsonweed leads to extreme thirst, delirium, incoherence, and coma. Both the twigs and foliage of cherry trees can be fatal to dogs if eaten as well. While all parts of the plant can be toxic, the leaves of sago palms can cause severe kidney and liver damage, even death, to dogs if ingested. Seeds are also severely toxic. While symptoms may vary between dogs in addition to the amount and part of the plant ingested, you should take your dog to the vet immediately once any unusual behavior takes place, especially when you suspect they may have eaten a toxic plant (which you’ll want to take with you to the vet as well).